Visible imagery from NASA’s Terra satellite revealed the extent of Tropical Depression 33W showed the tropical low pressure system moving into the central part of the Philippines on Nov. 20. Tropical Depression 33W (33W), known locally in the Philippines as Tropical Cyclone Samuel has triggered many warnings and watches. 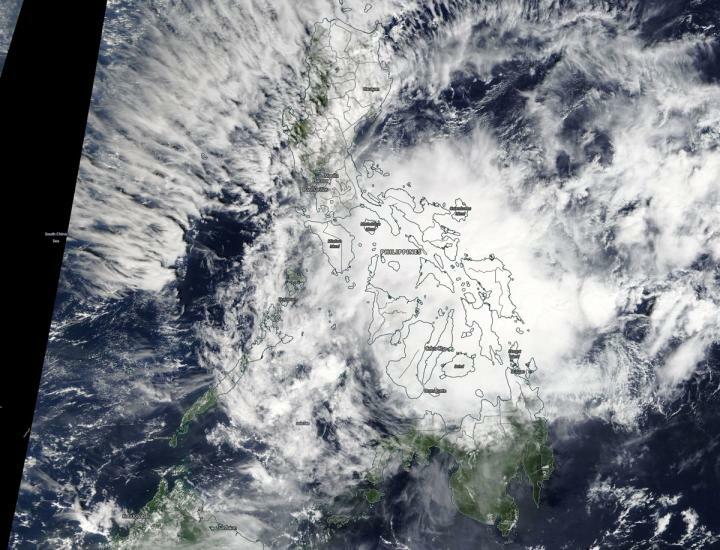 On Nov. 20 a visible image from the Moderate Resolution Imaging Spectroradiometer or MODIS instrument aboard NASA’s Terra satellite showed a large disorganized storm moving through the central Philippines. 33W will move generally west and cross the south-central Philippines. It is then forecast to move into the South China Sea and strengthen. The system will make a final landfall in central Vietnam and dissipate there.